Sometimes we recommend avoiding something because it’s a known harmful substance or because there is sufficient evidence to warrant exercising caution. This is based on the reporting from reputable sources such as the World Health Organisation, not on conspiracy theories or internet hysteria. We don’t advocate paranoia – we advocate education. Other times we recommend avoiding something because the way it’s made means it may have toxic contaminants that you don’t want on your skin (or in our environment). There are so many healthy alternatives available that there’s no reason to choose something that pollutes our bodies or our world. We also do our best to alert you to the ingredients and terminology that are commonly used in attempts to make products look more natural (or more ethical in other ways) than they really are. Although a brand / product can be marketed in a way that makes them seem clean or ethical, you can’t automatically assume that the care they’ve shown towards one cause extends to all other causes. A great case in point here is how people used to assume that because the Body Shop didn’t test on animals and used ingredients from other cultures, it was all healthy and ‘green’ in its content. It wasn’t, and didn’t claim to be, but people extended the Body Shop’s ethical positioning in their minds. I know that because I was one of them! That’s not intended as criticism, by the way, it’s just noting what happened… Anita Roddick was an amazing woman and I remember being incredibly inspired when seeing her speak at a lunch in the Adelaide Town Hall back in 2000, when she was touring for the release of her book, Business as Unusual. I recommend it, if you’re after a good book to read during the holidays! A brand may also attempt to position itself as ethical by financially supporting a cause, such as Breast Cancer, yet a quick glance at the ingredients list may reveal chemicals that are linked to cancer generally or breast cancer specifically. Or they might link to an environmental cause, yet use ingredients known to pollute landfill and waterways. They’re basically paying for ethical positioning instead of earning it. We try to provide the information that helps you to look past the hype so that you can make choices that really make a difference. Please note: that we rarely provide the brand names in our posts on product ingredients lists. Our aim is to educate and inform the people who care and want to know this information, not finger point and inflame for the sake of it. In those rare instances in which we give a name, we explain why we’ve done so. 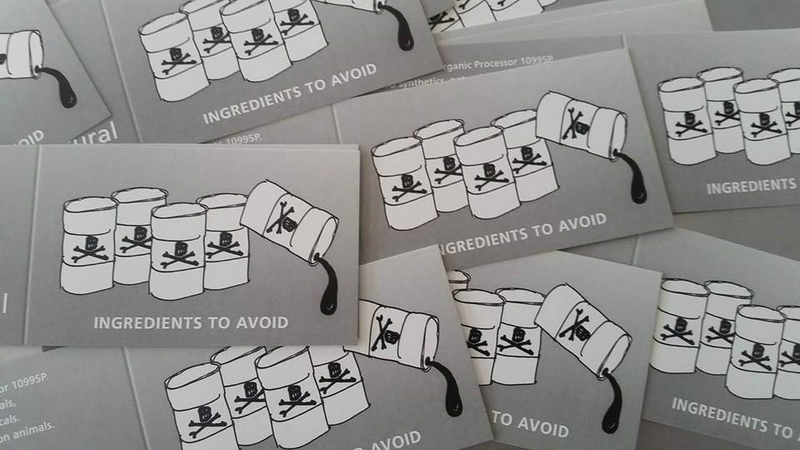 We’ve started enclosing an Ingredients to Avoid card in all our orders and we’re happy to enclose extras if you want to give some to your friends – just email info@ynatural.com.au or call us on 08 8294 1167. BTW for an extra tip that isn’t on the Ingredients to Avoid Card, look here!